10 ACRE CUSTOM BUILT HOME IN EXCLUSIVE GATED COMMUNITY - AN EQUESTRIAN DREAM! 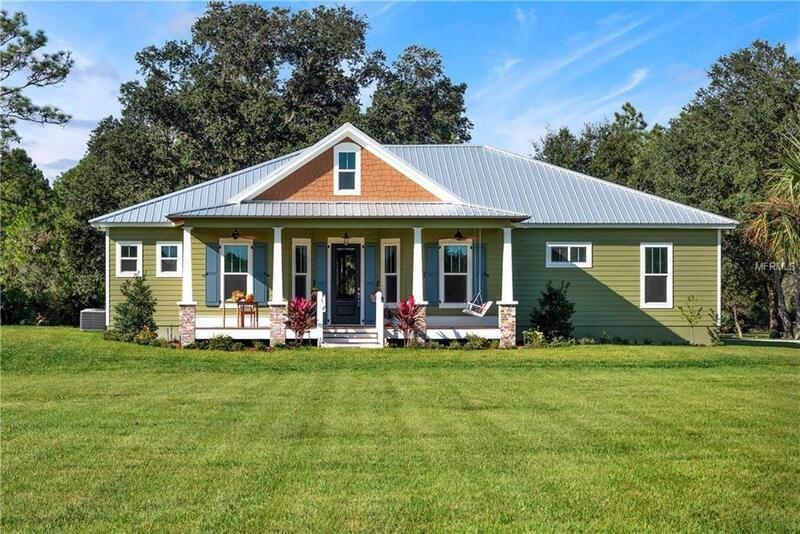 Welcome home to this magnificent and newly built 4 bed, 3 bath home with 2,427 premium SqFt and unmatched views of the private, wooded property which includes a network of wide trails bordered by a conservation easement. Come down the long driveway and you are greeted by the covered front porch perfect for taking in the morning sun. Once inside the front door you will notice how every detail has been carefully considered in crafting this home! The OPEN & BRIGHT KITCHEN boasts solid wood cabinets, all stainless appliances, large island perfect for entertaining and wood tile flooring for easy maintenance. The master retreat includes walk-in closet, dual sink vanity complimented by gorgeous subway tiling and walk-in shower. The split floor plan with an abundance of natural light boasts 3 additional guest bedrooms, office, family room, and formal dining room each with unparalleled views of this sprawling property. Step outside to see Florida living at its finest! This backyard setting includes a resort style pool with large sun shelf and spa complete with paver deck. Other extras: extensive millwork features include cased windows, door frames and columns, tray ceilings, crown moldings, shiplap, and built-in entertainment center. This is one home you do not want to miss! Schedule your private viewing today. Additional Lease Restrictions Buyer Responsible For Verifying Lease Restrictions With Hoa. Pet Restrictions Buyer Responsible For Verifying Pet Restrictions With Hoa.